The big think event for this week would or should have been peace. This was the 100th anniversary of the WW1 Armistice. The text for the week was the widow’s temple offering. And we had a local congregational fact of passing a budget and the fact of stewardship. The through line that I worked on in this sermon was this. Jesus points out the Widow as an example of faith. Her faith went in two directions. First she found what happened at that Temple to be meaningful. She supported the temple not because of the great stones that her mites wouldn’t do anything to support. She supported the temple because that is where she found the mercy and peace of God at. He faith also went outward in the fact that this God who had provided this peace was not limited to the temple, but would bestow his providence in her life. She offered the whole of her life because he trusted the promises of God which she had experienced there. In our world there are lots of things that want to say they provide peace and security. But the truth of all of them is that peace is not something we can create or every maintain. Peace is a gift of Almighty God. The history of the 20th century and the American experience of the 21st is proof of that. I didn’t include it here, but echoing Lincoln, it is beyond out ability to hallow. The only thing our great stones – our monuments – can do it point to the greater peace. And seeing that greater peace is acting as the widow. It requires faith. Specifically it requires faith in the other one who would give all he had to place the new cornerstone of the living temple – Christ. This sermon uses the example of a WW1 memorial cross that is currently under assault for exactly what it does – point not to the Armistice peace which soon failed but to the greater peace of the one who hung on the cross. The test of that peace then becomes are we willing to live out of it. Do we trust the providence of God like the widow? Or do we measure our peace and security like the others bringing their offerings. 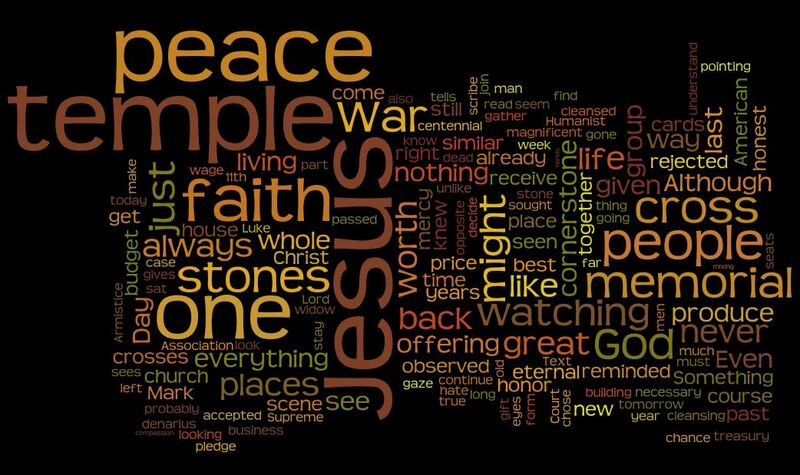 How do you measure the peace that Christ has given? Do we recognize its worth, or begrudge its price? Probably tried to do too much. But it is a much more complex and messy answer I think. It is the mystery of faith and its sustaining in this world. Worship Note: LSB 787, The Temple Rang with Golden Coins, is lovely simply hymn that walks the sermon through line very closely. It was our hymn of the day. I have included it at the end of the recording as a conclusion. We collected the pledge cards this week. Believe it or not, that was planned before actually looking at the text. If I had looked at the texts first, I’m pretty sure I would have said, “can’t do it that week”. There is a really crisp and clear direct application that feels just a little too easy. You could say, like Jesus did, look at the widow and go and do likewise. But to me the widow is not where most of us Americans are at. We are not that poor. We are not forced by circumstances to completely trust on the providence of God. Most Americans are more than likely in the scribal position. So here I concentrated on scribe a little bit more trying to illuminate the vocational problems and the problems with providence. The law in both cases is clear and comes from the larger context. 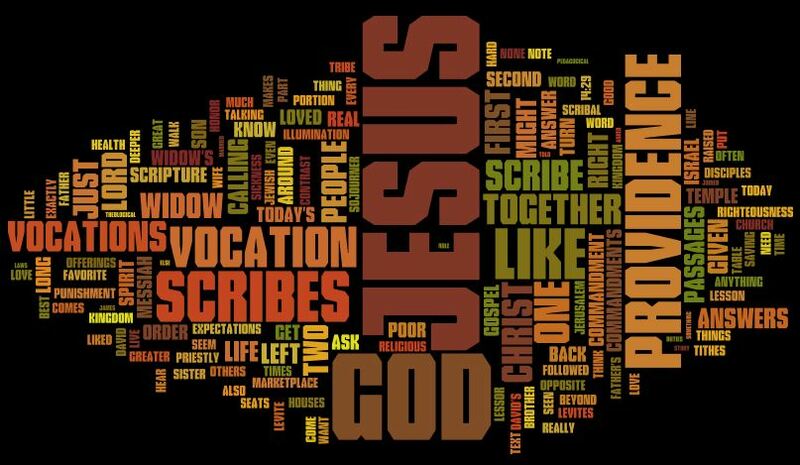 At the start of the larger section the text comes from Jesus answers what the most important commandments are – love the Lord your God and love your neighbor. The first is reliance upon providence and the second is carried out in our various vocations. What the scribe was doing, what we do so well, is instead of using our vocations for our neighbor, we use them to avoid or deny providence. The good news is that none of us have the vocation of messiah. That is Jesus alone. So we are still called to reliance upon providence and vocations of service to our neighbor, but when we fail Jesus is our salvation and our righteousness, because he did not fail. On a grading note, that above paragraph is a better summary than is probably in the sermon itself. The spirit of the staircase rules this week. As I left the pulpit certain things became clearer. But the Amen had already been said.